Here is a formula challenge for you. 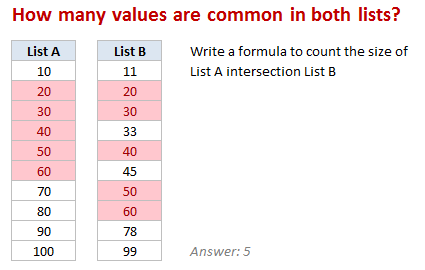 Now, how do you find the number of common values in both lists? We just want the count, not list of common values it self. Go ahead and figure out the formula and post your answers here. Write the formula if 2 lists have non-numeric values (text for example) ? Write the formula if 2 lists are not of same size (A1:A10 and B1:B15 for example) ? Write the formula if we have 3 lists (all same size, numeric values) ? Go ahead and share your answers. I am eager to see what you will come up with. PS: For some inspiration, check out this forum discussion. PPS: If you just want to highlight the common values, see this. It works with both numeric and text values and range B3:B12 can be extended to a third row. It doesn't matter if you compare to all elements in A, B or C, as if it has to be common over all three then it must appear in that list (that's why you only need two statements in your AND() formula) - this can be expanded for as many sets of data as you want, and it doesn't matter about the relative size, as long as you make your helper column as long as column A. If you were doing this for large sets of data then you'd probably want to replace A with whichever was shortest, but in the example given it doesn't really matter. In this case, you're doing the same basic operation as above, but by replacing the AND() statement with an OR(), and adding in a condition to say "check B against C". This time you have to make your helper column as long as the second shortest of A, B and C.
to highlight if it's common over A and B or A and C.
The sumproduct avoids having to use CSE to confirm. And the lists can be of different size. I don't think it matters if the lists are different sizes - I used ISNA instead of ISERROR so that it only caught the missing matches, and not any other errors. Sorry, but in Spanish excel we use semicolon instead comma. Grant beat me to it. Interesting formula if E9:E17 contains no duplicate and F9:F17 does. It still gives of number of distinct occurrences. =SUM(COUNTIF($A$1:$A$10,B1:B10)) as an array formula. You would need to sort them first. The name is not necessary, just for presentation purposes. This method should cover bonus challenges 1 and 3 as well. =IFERROR(COUNT(MATCH(F6:F15,E6:E15,0)),"") use Ctrl + Shift + Enter. Here comes our solution to this issue. Same formula works for bonus questions 1 and 2. Now Please tell which one is convenient??? It is considered, in the COLUMN A or COLUMN B duplicate value may be typed. The answer shouldn't be 9 with the data you provided but 3. The common elements between all tables are 30,50,60. On top of this, why do you use SUMPRODUCT when you have only one table e.g. COUNTIF(B2:B11,A2:A11) (cse)? a simple SUM would suffice. 1°) Write the formula if 2 lists have non-numeric values (text for example) ? 2°) Write the formula if 2 lists are not of same size (A1:A10 and B1:B15 for example) ? 3°) Write the formula if we have 3 lists (NOT all same size, NON-numeric values) ? Works for alpha, numeric and mixed lists and diferent size lists. entered as an array formula. - type: activecell.Formula = " copy english formula "
Works with both Numeric and Text Value. Just a version of previous formula with changed range. Extended version of the First Formula, does well with any no. of columns and range. This formula array worked, but I don't really know why the division by 2. Maybe it's a case for some Forensics? if there is a duplicate there will be two copies of each value hence the /2 part. I have to use conditional formatting. step1:I have to select total data wher we want change colour. step2:then i have to go in conditional formating & select new rule . step3: select Use a formuleto determine which cells to formate. It would be double negative instead of the the double negative visible as only a single negative. Thanks....getting use to the excel blogs !! Sum of '1s' in C1:C10 is the no. of values that are common between A1:A10 and B1:B10. This works with lists of varying sizes too. works with different list sizes. Criteria range must be same in both arguments. I tested permuting A, B, C. If criteria range is different it won't work.